JORA TRANG WINs IN OUR SUBSCRIBER DRIVE! JORA TRANG WINS IN OUR SUBSCRIBER DRIVE! diaCRITICS wants to add 100 new subscribers! The 5th, 40th, 75th, and 100th subscribers (and those who referred them) get their pick of prizes. Jora Trang is our 5th subscriber. She wins a signed first edition of Viet Thanh Nguyen’s The Sympathizer. Look for the New York Times Book Review’s front page review of The Sympathizer on Sunday, April 5th. If you enjoy reading our posts as much as Jora does, then we encourage you to subscribe! We are well on our way to our 40th new subscriber. A little more information about Jora Trang comes below. I was born in Đà Lạt and I came here in 1975 at the Fall of Saigon. Tell us about this picture at Camp Pendleton. This is one of the few pictures I have from my childhood. It was taken by a journalist visiting the camp. 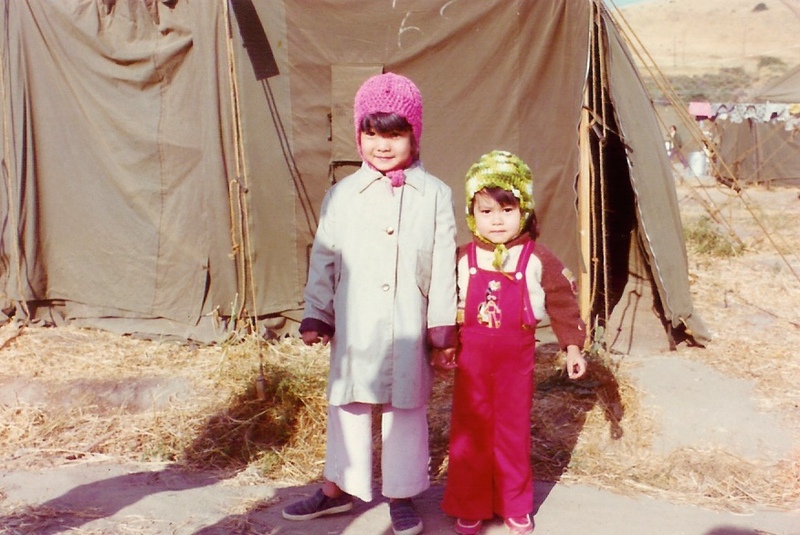 We stayed at Camp Pendleton shortly after coming to the United States from Guam before we were “sponsored” by an American family for resettlement. I am here with my younger sister. I was 4 1/2 and she was 2 1/2. We had no idea what was going on – only that we had to stand in long lines for egg and milk! This picture was featured in a newspaper in 1975 but I cannot find which paper it was in. The reporter provided my mother with a copy of the picture. Do you have a favorite Vietnamese or Vietnamese Diasporic work of art? If so, tell us about it. I like “The Frangipani Hotel” by Violet Kupersmith, which is one of the first literary works (that I know of) published by a Vietnamese American that borders on speculative fiction and literature. I believe literary speculative fiction can be a powerful vehicle for social commentary – and has been in the United States for a long time. Star Trek, for example, was the first integrated spaceship (television cast) during a time when integration was highly controversial. There are a number of strong Vietnamese speculative fiction writers whose work make strong social commentary on the Vietnamese experience through the vehicle of speculative fiction. For example, award winning Aliette de Bodard, has published many works about a Vietnamese space opera in which she explores assimilation and colonialism! Nghi Vo’s stories embellish Vietnamese folktales exploring the complexity of relationships of Vietnamese people. And zm quynh is gaining recognition for strong character driven stories that highlight the Vietnamese refugee experience in the context of colonialism and a politicized/racialized world. It seems like a new era of artists are rising in the U.S. – the 1.5 and 2nd generation Vietnamese Americans are starting to create literature that will bring a fresh perspective to our experience as we continue to thrive and grow. Its an exciting time to be a book-lover and avid reader. I am so excited to receive and read your book!! !